The Fruit Tree Borer has been a serious pest in ornamental and native trees for some time, and it now poses a real and increasing threat to Golden, Dutch and English elms. 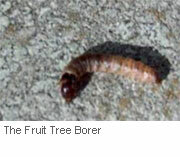 The fruit tree borer is a known pest to over fifteen species of trees and vines, and has an ever-increasing host range in deciduous trees. It has been identified in Golden and Dutch elm cultivars; and recently in English elms. 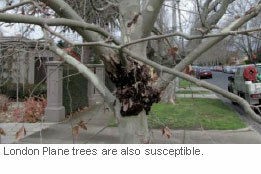 Damage is also common in plane trees, maples, ginkgos, birch, oak and rosaceae species. 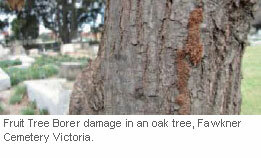 Fruit tree borer will target healthy and stressed trees alike. 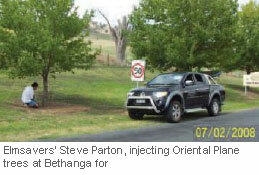 Elmsavers’ Steve Parton, injecting Oriental Plane trees at Bethanga for Towong Shire Council in northeast Victoria. 7 February 2008. Originally a serious pest in native trees with a preference for black wattles, the fruit tree borer has quickly adapted to the softer and sweeter wood of exotics. Damage to prunes was first mentioned in 1948; initially it was limited to small limbs; however damage is now seen on large and small limbs as well as on tree trunks. Although the fruit tree borer (M. melanostigma) follows a typical moth life cycle, its number of instars and flight times of adult moths are not fully known. The adult moths are difficult to find – they are nocturnal and active during the summer months, but have been reported as readily coming to light. 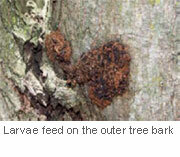 Eggs are laid on the bark in the summer; larvae then burrow in and seal the entry point with “frass” (sawdust). Larvae sites can be identified by a frass covering over their tunnels in the early instar. Frass has a boot lace appearance on the trunk; later instars have a woven silk covering which is effective in keeping out predators such as birds. The longest period of the fruit tree borer life cycle is in the larval stages, and is thought to last up to two years (Lloyd, 1972). The caterpillars will later pupate within their tunnels. During the larval stages of the life cycle, the larvae are sheltered in tunnels so control by tree-injection using newer systemic insecticides that are Lepidopteran toxic is the only practical solution in a non-crop situation. Caterpillars feed in the sapwood through to the outer bark and the injected insecticide placed into the sapwood (xylem) will kill new larvae quickly as they bore in – breaking the cycle. Established larvae may take longer to succumb as they mainly feed on the outer bark, eventually they will penetrate the cambial tissue and die accordingly. 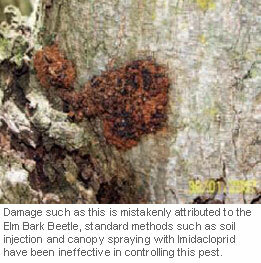 Fruit tree borer damage can be mistakenly attributed to the Elm Bark Beetle, and standard methods such as soil injection or trunk injection with SilvaShield® (both Imidacloprid formulations) have been ineffective in controlling this pest. Fruit tree borer and other lepidopteran insects are immune to Imidacloprid insecticides regardless of the formulation or delivery methods used. 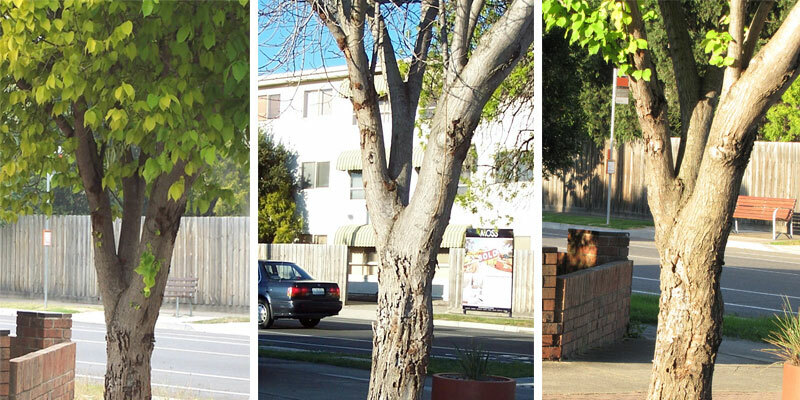 The tree in the above images was previously tree (trunk) – injected with Imidacloprid on 26 May 2005. 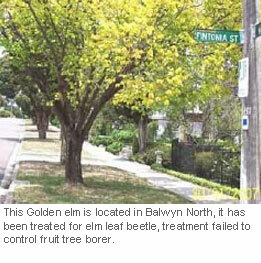 The treatment focused primarily on elm leaf beetle, and residual chemistry was still giving good results on elm leaf beetle at season’s end in 2007. Imidacloprid had little effect in controlling fruit tree borer, and this has been replicated hundreds of times on many different tree species with the same outcome. 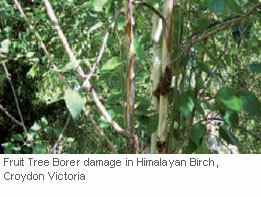 The tree was re-injected again on 1 May 2007 using chemistries that are effective against lepidopteran insects. 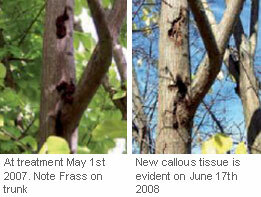 Note in the second image that the borer damage in all instar stages has ceased and new callous tissue is growing. Our dual treatment combats both Fruit tree borer and Elm leaf beetle in one application. 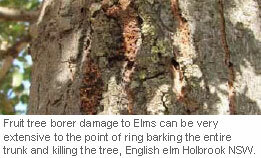 Fruit tree borer damage in Golden elms can be very extensive to the point of ring barking the entire trunk and killing the tree. Elmsavers has successfully treated thousands of trees with our proprietary chemistry. 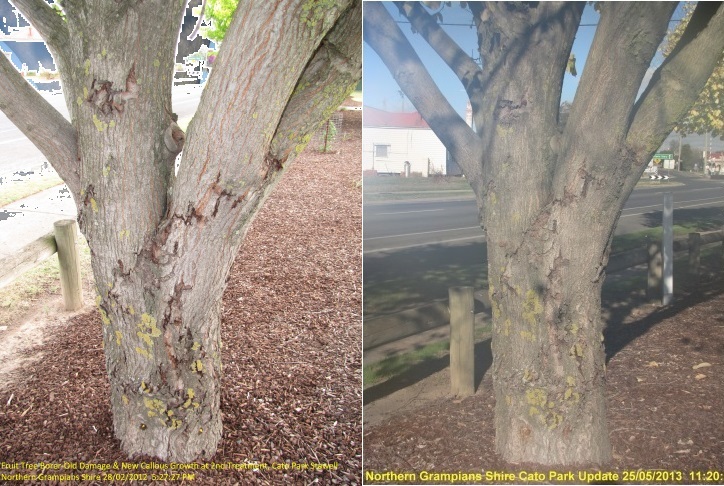 Damage such as this is mistakenly attributed to the Elm Bark Beetle, standard methods such as soil injection and canopy spraying with Imidacloprid have been ineffective in controlling this pest. Acknowledgments: Susan P. Marte, BSc, MSc (Hons), Robert N. Spooner-Hart, W. Graham,Thwaite Centre for Horticulture and Plant Sciences Hawkesbury, Richmond. 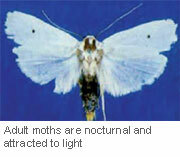 NSW CSIRO for image of adult moth. 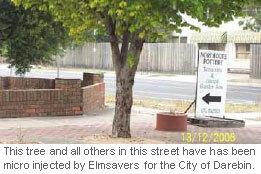 All Images and Data in this document are the property of Elmsavers, a Division of Environmental Tree Technologies Pty Ltd. Reproduction of this document is not permitted and unauthorised use as promotional material by Individuals or Companies is prohibited without approval from Elmsavers.